This coral reef at Hawksbill Reef near Bimini in The Bahamas shows several different kinds of mature corals. Corals grow slowly, about 1/4 of an inch each year. The coral colonies in this picture are up to 2 feet across, so these colonies may be 100 years old. 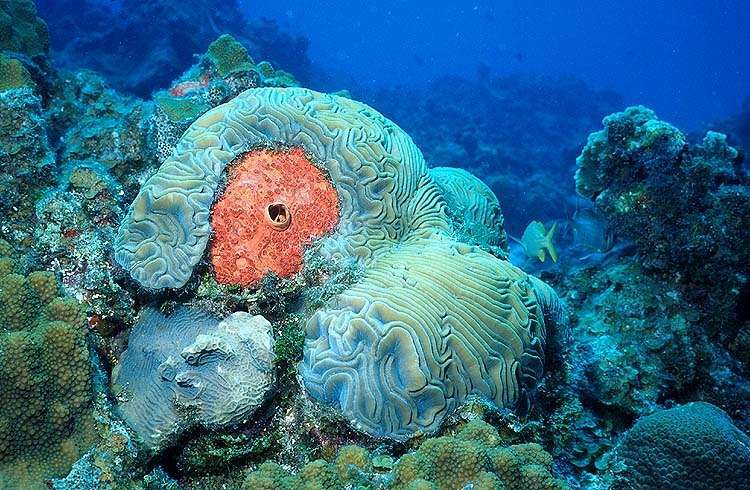 The center of this picture shows a Grooved Brain Coral battling with an Orange Boring Sponge. The ridges on the Grooved Brain Coral give this coral its name and also provide shelter for the individual coral animals. Below the Brain Coral is a Lettuce Coral. The Lettuce Coral resembles a Brain Coral because it is covered with grooves and ridges. However, these grooves and ridges are smaller on the Lettuce Coral. These grooves and ridges also provide shelter for the coral animals during the day, and you can see the Lettuce Coral polyps' tentacles at night. All around the Brain and Lettuce Corals you can see the yellow-green lumps of Boulder Star Corals. These corals are covered by small "pimples." Each "pimple" is the home of one Star Coral polyp. These coral colonies compete with each other for space on the reef. The boundary between each colony is a kind of "no-man's land" where the coral polyps of neighboring colonies fight with each other for space to grow on the reef. Because of this competition, no corals grow in this boundary. The boundary is occupied by algae and sponges. The large Orange Boring Sponge has eaten away at the Grooved Brain Coral, fighting for its own space to grow on the reef. Unless there are other animals to eat these sponges, sponges can eventually take over the reef.